I’m going for a 1-1 draw on Saturday. Goal from Angel for us, Galindo for the Goats. I think Chivas are desperate for points. Chivas are desperate for points, that's why I believe this tilt will be like a Cup Final for them. 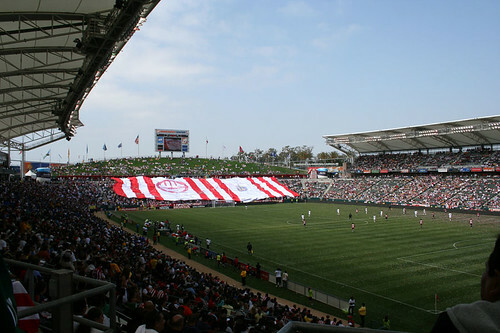 That said, there's no way Chivas are a better team than Seattle and the Home Depot Center atmosphere is nowhere near Quest Field-like. I'm going to go with a 2-0 win for RBNY. If I have to predict who's going to score, then I'm going with Juan Pablo, as he's due one, with Kandji scoring the other. I see this game going 2-1 New York. As awesome as our defense has been, teams have had their chances. One of these days, one's getting past Bouna. Saturday's the day. Our goals: Stammler rockets one in on a sweet pass from Lindpere, and Ibrahim (who comes off the bench in the 64th minute) holds the ball up in the box, attracts 2 defenders and manages to poke the ball through to an unmarked Angel who finally puts up his first of the year. Your New York Red Bulls will be off to their best start in team history, and Chivas USA will be in a very deep hole. Based on how Mr. Backe has this team playing, with such supreme organization, the New York Red Bulls will achieve another clean sheet. There is not reason to believe that Chivas can break down the best backline in the League, when Chicago couldn't. Also, RBNY player's will be inspired by Mr. Backe's show of Iron Will, as he is now back with the team. We're also due for some scoring. My prediction: RBNY 3 - Chivas USA 0. We need that type of player here, someone who can bust up a pub. He would be an inspired signing. You might recall that in our Tuesday Kick-Around, I brought up some interesting quotes about Tchani. It seems that Mr. Backe is of another opinion and that's good enough for me. Bondy also has this great feature on RBNY goal keeper Bouna "Time" Condoul. Brian Lewis has his own great Condoul feature out today. Check them both out! Also, just because the Red Bulls haven’t brought back fan favorite Dave van den Bergh yet doesn’t mean they're ignoring the gaping hole on the left wing. A source said GM Erik Soler is out of town personally checking out a left winger that could bring some pace and skill to that side of the field. Stay tuned …. RBNY Cool Link Of The Day: Meet Conor Chinn (aka Guillermo Ortiz). Thanks to irishapple21 for coming up with that one on Big Soccer.